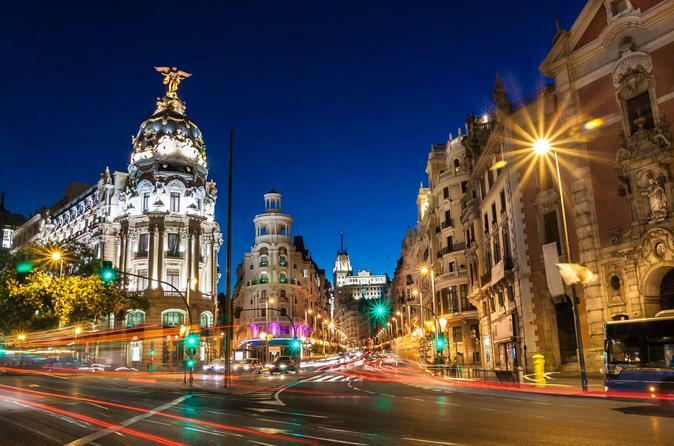 Visit the fascinating city of Madrid at night with its beautiful lights on this walking tour where you can enjoy a different way to appreciate the city! Meet the most important points of Madrid with this complete night city tour for small groups when the night begins, and get another perspective on the Madrilene life. Besides, you’ll get a unique show displaying the live tradition of Flamenco dance in one of the best known places to enjoy this passionate dance. Get to know the Madrilene lifestyle at night and enjoy a different way to appreciate the city. Get a panoramic view of Palacio Real and Gran Via, the most famous street in the city of Madrid. Our ending point for this part of the tour is one of the oldest squares of the city, Plaza Mayor. You will get to know the main restaurants and bars so you can know how nightlife is in Madrid! If you wish, you can stay there to have dinner or get some drinks (at your expense) and continue enjoying the night at Madrid for a while, before enjoying a unique show of flamenco in a Tablao, where the emotional expression of the artists becomes an intensely personal and unforgettable experience for the spectator.